I have always been fascinated by the idea of being able to speak and understand multiple languages. I think about it like this: there are infinite ways to express a single feeling or concept in one language- now multiply that by as many languages as you know, and you’ve got several sets of infinite ways of expressing yourself. It’s such an interesting thing to think about, and I am extremely envious of those who know more than one language. Ever since I started taking Spanish classes in middle school it’s been a goal of mine to read an actual book- not one written to teach people Spanish, but an actual novel – in another language. And now, I am so happy to finally be able to say that I have accomplished my goal! 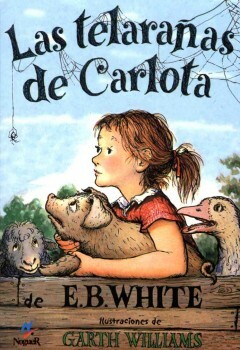 Over the weekend I finished reading Las Telaranas de Carlota, which is the Spanish translation of Charlotte’s Web by E. B. White. Thanks to one of my friends, I was able to borrow a physical copy of it to read. I never read this book before or saw the movie (GASP. I know. I don’t know what I was doing during my childhood.) so I initially had no idea what the story was actually about. I mean, I gathered that it was about a girl and a pig and a spider on a farm, but other than that I was pretty much clueless. You can imagine my surprise when Wilbur started talking- I honestly thought that I had read it completely wrong and had to check the conjugation of the verb in Spanish to make sure I was understanding it correctly. Yup, the animals talk. I wasn’t expecting that. I really enjoyed the story (it was adorable but so sad at the end. SO SAD.) but what I liked most of all was that I was able to read it in another language. My Spanish skills aren’t that great, and I certainly didn’t understand every single word, but I understood the general events of the story and could follow the plot pretty well. That’s what surprised me the most: how much I could understand even with my limited Spanish vocabulary. I thought I would have to be constantly looking up words and using some sort of translator to understand it, but the story was simple enough that I was fine without those things. At first it took me quite a while to read each page, but as I progressed I found that it got easier and easier and soon I was flipping through it pretty quickly. I still read slower than my usual pace, but I guess that’s to be expected. Overall, reading a novel in another language for the first time was a very positive experience for me. It may just be a children’s book, but it’s a book nonetheless and it’s at least a starting point to move forward from. I don’t know if any of you are interested in languages like I am, but if you are then you should definitely try to read a book in a different language. It’s a lot of fun, and I found that I gained much more vocabulary from it than from doing worksheets in Spanish class at school. Have you ever read a book in another language? Do you speak multiple languages? Do you prefer to read translations or books that were originally written in other languages? Let me know in the comments section below! I’ve taken French since grade four, so I’m fairly proficient at writing and speaking it (though I’m sure my accent is horrible), and I’m currently taking my second university German course. I re-read the Harry Potter series when I was in high school, and I made sure to read them in French as my way of studying for my final exam. I really enjoyed it! 🙂 I was already quite familiar with the stories, so even though I didn’t know all of the words that I came across, I was able to deduce their meanings based on what point of the book I was at.